A unique self-supporting open top storage tank. 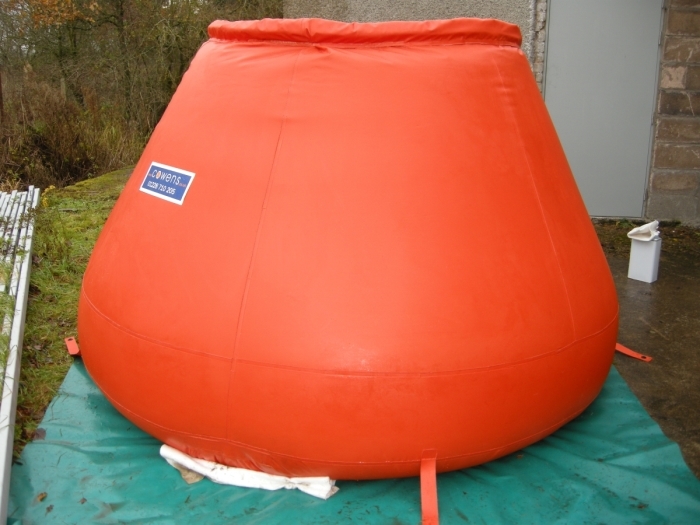 The tank is ideal for use in clean up operations and is easy to handle and fill even in adverse weather conditions. Use for containment of spills, as a transfer tank or temporary liquid storage. No frame is required and filling can start within seconds of laying it out on the ground. A built in buoyancy collar even supports the weight of filling hoses, while a self sealing valve at the base allows for watertight filling and emptying. Its small collapsed size makes it ideal for inclusion in an emergency response kit. Its durability and chemical resistance makes it suitable for most spills over a long life time. Manufactured in heavy duty polyurethane in sizes ranging from 1.5 to 10 tonnes (2500 litre, 6000 litre, 8000 litre capacity available), these tanks fold down to less than 5% of their filled volume. The Instee tank is also fitted with a centre ring located at the base of the tank for ease of elevation for cleaning. Only Cowen Flowline manufacture the Instee Tank.